Chemistry, Seventh Edition aims to help your students understand the connections between topics in general chemistry and why they matter. 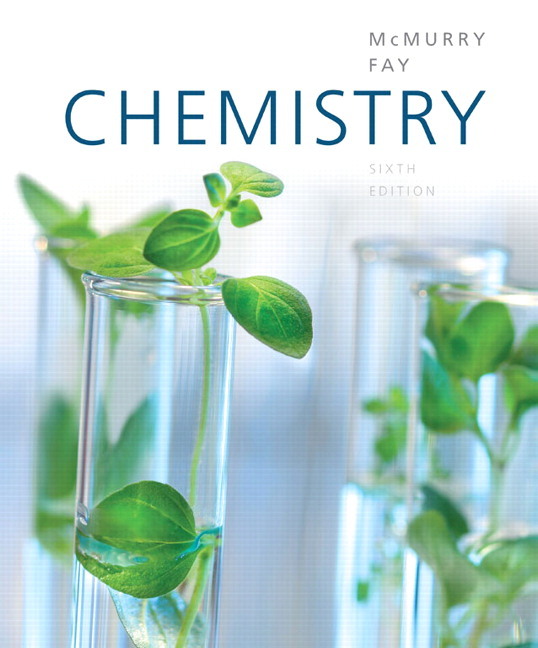 This new edition provides a concise and streamlined narrative that blends the quantitative and visual aspects of chemistry, demonstrates the connections between topics, and illustrates the application of chemistry to their lives and careers. New content offers a better bridge between organic and biochemistry and general chemistry content, and new and improved pedagogical features make the text a true teaching tool rather than just a reference book. REVISED | Inquiry Sections now include worked examples and/or practice problems enabling students to directly apply the concepts and skills they have learned throughout the chapter to topics that connect the material to issues in their daily lives. In-chapter Conceptual Worked Examples give students their first exposure to working through problems on a conceptual level. In-chapter Conceptual Problems give students an immediate opportunity to solve problems that test their understanding of chemical concepts. End-of-chapter Conceptual Problems give students an opportunity to test that they understand all of the major concepts in the chapter before moving on to the multi-concept problems that require this understanding. NEW | Extension of worked examples help students move away from memorization as a primary problem-solving method by explicitly showing them the relationship between similar but related concepts and procedures, while facilitating their ability to recognize and respond to these challenges. NEW | Chapter Study Guide offers a modern and innovative way for students to review each chapter. Prepared in a grid format, the main lessons of each chapter are reiterated and linked to learning objectives, associated worked examples, and representative end-of-chapter problems. The new format allows students to refresh recollection, identify the most crucial worked examples, and test their understanding and skills all in one place. NEW | Heavily expanded coverage of atmospheric topic has been added to the chapters on gases. Well-known environmental chemist, Andy Jorgensen from the University of Toledo, contributed significantly to this chapter by helping add content recommended by the ACS that includes the topic of climate change and reinforces key chemical concepts of bonding, polarity, equilibrium, kinetics, etc. within the context atmospheric chemistry. NEW | Chapter on Organic and Biological Chemistry introduces students to useful nomenclature and skills that must be mastered early in an organic chemistry course. In the new version of Chapter 23, students no longer move through rote descriptions of groups of organic compounds but instead learn about them in the context of conceptual lessons, many of which revisit ideas introduced in prior chapters (especially concepts of structure and bonding introduced in Chapters 7 and 8). 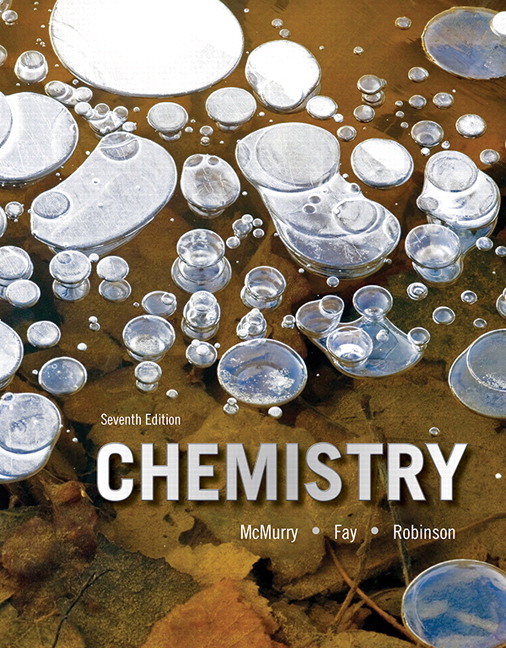 Review the table of contents below for Chemistry, Seventh Edition to gain a better understanding of the textbook’s organization and the topics covered in each chapter. Chapter 10 and Chapter 23 are available for download as sample chapters in PDF format. You'll need Acrobat Reader to view the chapters. NEW | Dynamic Study Modules are designed to enable students to study effectively on their own by helping them quickly access the information they need to be more successful on quizzes and exams. Utilizing a dynamic process of test-learn-retest, these modules adjust to the needs of each individual student and enable mastery of the material. They can be accessed on smartphones, tablets, and computers, and the results can be tracked in the Mastering Gradebook. Adaptive Follow-Ups are personalized assignments that pair Mastering's powerful content with Knewton's adaptive learning engine to provide personalized help to students before misconceptions take hold. These assignments address topics students struggled with on assigned homework, including core prerequisite topics. Engage students effectively with personalized content and tools. Chapter 10 and Chapter 23 are available for download as a sample chapter in PDF format. You'll need Acrobat Reader to view the chapter. John McMurry, educated at Harvard and Columbia, has taught more than 20,000 students in general and organic chemistry over a 40-year period. An emeritus Professor of Chemistry at Cornell University, Dr. McMurry previously spent 13 years on the faculty at the University of California at Santa Cruz. He has received numerous awards, including the Alfred P. Sloan Fellowship (1969–71), the National Institute of Health Career Development Award (1975–80), the Alexander von Humboldt Senior Scientist Award (1986–87), and the Max Planck Research Award (1991). With the publication of this new edition, he has now authored or coauthored 34 textbooks in various fields of chemistry. Jill Robinson received her Ph.D. in chemistry from the University of Colorado at Boulder where she developed a portable instrument for measuring nitric oxide in exhaled breath as an indicator of pulmonary inflammation. Known for his clear, well organized lectures, Dr. Fay was the 1980 recipient of the Clark Distinguished Teaching Award. He has also taught as a visiting professor at Harvard University and the University of Bologna (Italy). A Phi Beta Kappa graduate of Oberlin College, Dr. Fay received his Ph.D. from the University of Illinois. He has been an NSF Science Faculty Fellow at the University of East Anglia and the University of Sussex (England) and a NATO/Heineman Senior Fellow at Oxford University. She is currently a Senior Lecturer in Chemistry at Indiana University and has taught thousands of students in general, environmental, and analytical chemistry courses. Active learning strategies such as group discussions, student response systems, and student-directed lab projects are always used in her classes to engage students and improve learning. She has developed laboratory materials for the analytical sciences digital library website and enjoys bringing cutting edge nanoscience to local schools and science museums in a program called Molecules Matter (M2). She has received numerous awards including, the Student Choice Award from the University of Wyoming Honors College, Indiana University Board of Trustees Award for Excellence in Teaching, and the Indiana University President’s Award for Distinguished Teaching. She also serves as faculty advisor for several student organizations and as an academic mentor for student athletes. In her free time, she likes running, reading, and spending time with her family. Superior support beyond the classroom with MasteringChemistry. The text and the technology assets of MasteringChemistry® are designed to work in tandem, to create a seamless learning suite to supporting student learning before, during and after class. NEW! Dynamic Study Modules are now assignable, Dynamic Study Modules (DSMs) enable your students to study on their own and be better prepared to understand class material. When your students use DSMs outside of class to develop their math and chemistry skills you can spend precious class time on higher-order learning and problem solving. The mobile app is available for iOS and Android devices for study on the go. Reading Quiz questions can be assigned in MasteringChemistry, immersing students in the text prior to class and improving their comprehension of chapter content so you can focus on the toughest topics in class. Tutorials, featuring specific wrong-answer feedback, hints, and a wide variety of educationally effective content guide your students through the toughest topics in chemistry. The hallmark Hints and Feedback offer instruction similar to what students would experience in an office hour, allowing them to learn from their mistakes without being given the answer. NEW! eText 2.0 available for January 2016 classes! · Now available on smartphones and tablets. · Seamlessly integrated videos and other rich media. · Configurable reading settings, including resizable type and night reading mode. · Instructor and student note-taking, highlighting, bookmarking, and search. NEW! MasteringChemistry activities are integrated throughout. Inquiry Activities from the text are integrated into Mastering as gradeable items. Video Tutor Solutions walk students through the problem solving process in the author’s own voice. NEW! Adaptive Follow-Up Assignments allow instructors to deliver content to students—automatically personalized for each individual based on the strengths and weaknesses identified by his or her performance on initial Mastering assignments. NEW! Interactive Simulations cover some of the most difficult chemistry concepts and are assignable. Written by leading authors in simulation development, these increase students’ understanding of chemistry and clearly illustrate cause-and-effect relationships. 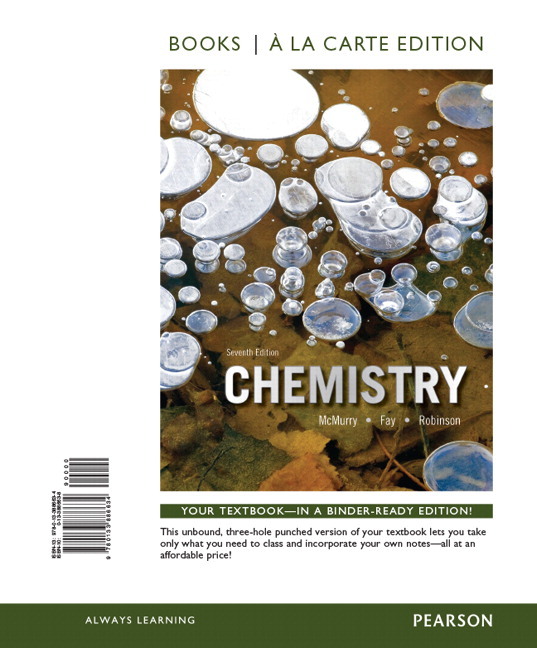 End-of-Chapter Problems and Questions from the textbook are now easily assignable within MasteringChemistry to help students prepare for the types of questions that may appear on a test. Pause and Predict Video Quizzes bring chemistry to life with lab demonstrations illustrating key topics in general chemistry. Students are asked to predict the outcome of experiments as they watch the videos; a set of multiple-choice questions challenge students to apply the concepts from the video to related scenarios. Unique and easy-to-use, Java-free Chemistry Drawing Tool lets students draw a diverse range of structures. REVISED! Inquiry Sections now include worked examples and/or practice problems enabling students to directly apply the concepts and skills they‘ve learned throughout the chapter to topics that connect the material to issues in their daily lives. REVISED! Table of Contents creates more uniform themes within chapters and a more coherent progression of concepts that build on one another. NEW! Chapter on Organic and Biological Chemistry introduces students to useful nomenclature and skills that must be mastered early in an organic chemistry course. In the new version of Chapter 23, students no longer movethrough rote descriptions of groups of organic compounds but instead learn about them in the context of conceptual lessons, many of which revisit ideas introduced in prior chapters (especially concepts of structure and bonding introduced in Chapters 7 and 8). NEW! Figure It Out feature. Selected figures include optional questions designed to get students to look at each illustration more carefully and recognize general lessons offered in each figure. Answers to Figure it Out questions are inverted directly beneath the figure to encourage students to answer first without assistance before easily being able to check their response. NEW! Chapter Study Guide offers a modern and innovative way for students to review each chapter. Prepared in a grid format, the main lessons of each chapter are reiterated and linked to learning objectives, associated worked examples, and representative end-of-chapter problems. The new format allows students to refresh recollection, identify the most crucial worked examples, and test their understanding and skills all in one place. NEW! Extension of worked examples help students move away from memorization as a primary problem-solving method by explicitly showing them the relationship between similar but related concepts and procedures, while facilitating their ability to recognize and respond to these challenges. Many of the graphics are annotated, reflecting what an instructor would say to a student in order to help them understand the concept more clearly. These are set off in a different font from the figure captions so that students can readily locate this information. Topic Connections that begin with “Remember…” explain how individual topics are related, and give sufficient information so students either don’t have to “flip back”, or know when they should. Dynamic Study Modules Now assignable, Dynamic Study Modules (DSMs) enable your students to study on their own and be better prepared to understand class material. When your students use DSMs outside of class to develop their math and chemistry skills you can spend precious class time on higher-order learning and problem solving. The mobile app is available for iOS and Android devices for study on the go. MasteringChemistry activities are integrated throughout. Adaptive Follow-Up Assignments allow instructors to deliver content to students—automatically personalized for each individual based on the strengths and weaknesses identified by his or her performance on initial Mastering assignments. Interactive Simulations cover some of the most difficult chemistry concepts and are assignable. Written by leading authors in simulation development, these increase students’ understanding of chemistry and clearly illustrate cause-and-effect relationships. eText 2.0 available for January 2016 classes! Chapter on Organic and Biological Chemistry introduces students to useful nomenclature and skills that must be mastered early in an organic chemistry course. In the new version of Chapter 23, students no longer movethrough rote descriptions of groups of organic compounds but instead learn about them in the context of conceptual lessons, many of which revisit ideas introduced in prior chapters (especially concepts of structure and bonding introduced in Chapters 7 and 8). Figure It Out feature. Selected figures include optional questions designed to get students to look at each illustration more carefully and recognize general lessons offered in each figure. Answers to Figure it Out questions are inverted directly beneath the figure to encourage students to answer first without assistance before easily being able to check their response. Chapter Study Guide offers a modern and innovative way for students to review each chapter. Prepared in a grid format, the main lessons of each chapter are reiterated and linked to learning objectives, associated worked examples, and representative end-of-chapter problems. The new format allows students to refresh recollection, identify the most crucial worked examples, and test their understanding and skills all in one place. Extension of worked examples help students move away from memorization as a primary problem-solving method by explicitly showing them the relationship between similar but related concepts and procedures, while facilitating their ability to recognize and respond to these challenges. previously spent 13 years on the faculty at the University of California at Santa Cruz. He has received numerous awards, including the Alfred P. Sloan Fellowship (1969–71), the National Institute of Health Career Development Award (1975–80), the Alexander von Humboldt Senior Scientist Award (1986–87), and the Max Planck Research Award (1991). With the publication of this new edition, he has now authored or coauthored 34 textbooks in various fields of chemistry. Jill Robinson received her Ph.D. in chemistry from the University of Colorado at Boulder where she developed a portable instrument for measuring nitric oxide in exhaled breath as an indicator of pulmonary inflammation. She is currently a Senior Lecturer in Chemistry at Indiana University and has taught thousands of students in general, environmental, and analytical chemistry courses. Active learning strategies such as group discussions, student response systems, and student-directed lab projects are always used in her classes to engage students and improve learning. She has developed laboratory materials for the analytical sciences digital library website and enjoys bringing cutting edge nanoscience to local schools and science museums in a program called Molecules Matter (M2). She has received numerous awards including, the Student Choice Award from the University of Wyoming Honors College, Indiana University Board of Trustees Award for Excellence in Teaching, and the Indiana University President’s Award for Distinguished Teaching. She also serves as faculty advisor for several student organizations and as an academic mentor for student athletes. In her free time, she likes running, reading, and spending time with her family.